There are three memorials to Rev Alexander Peden within the same enclosure to the left of the entrance gate to the old cemetery. The oldest is a flat slab lying in front of the large memorial. A headstone is also located here. THAT FAITHFUL MINISTER OF CHRIST,WHO. FOR HIS UNFLINCHING ADHERENCE TO THE COVENANTED REFORMATION IN SCOTLAND,WAS EXPELLED BY TYRANT RULERS FROM HIS PARISH OF NEW LUCE,IMPRISONED FOR YEARS ON THE BASS ROCK BY HIS PERSECUTORS,AND HUNTED FOR HIS LIFE ON THE SURROUNDING MOUNTAINS AND MOORS, TILL HIS DEATH ON 26TH JANUARY 1686 IN THE 60TH YEAR OF HIS AGE, AND HERE AT LAST , HIS DUST REPOSES IN PEACE,AWAITING THE RESURRECTION OF THE JUST SUCH WERE THE MEN THESE HILLS WHO TRODE STRONG IN THE LOVE AND FEAR OF GOD DEFYING THROUGH THE LONG DARK HOUR, ALIKE THE CRAFT AND RAGE OF POWER. The monument was restored by the SCMA. 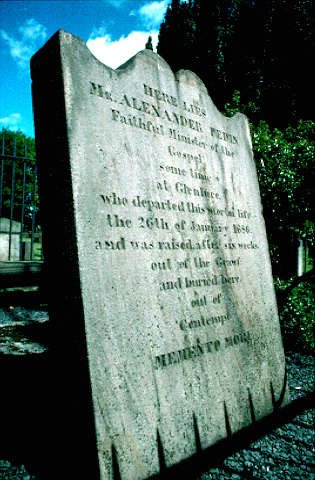 One of the most famous Covenanters was Rev Alexander Peden who, despite not having been put to death, was nevertheless a victim of persecution, and harassment for most of his adult life. For a period of several years he was incarcerated on the bleak Bass Rock in the Firth of Forth. His life was probably curtailed by the many privations and the cold, suffered as he wandered the country, preaching (illegally) the doctrines of the Presbyterian Kirk. Peden has the doubtful distinction of being buried twice! 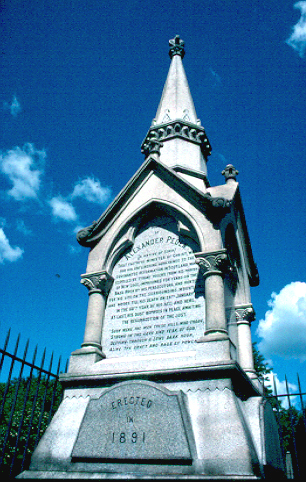 He died in Auchinleck Parish but, the dragoons who had been unsuccessful in capturing him – having got to hear of his burial in Auchinleck Kirkyard, dug up his body after six weeks, and transported it to Cumnock, with the aim of hanging it in chains on the gibbet. 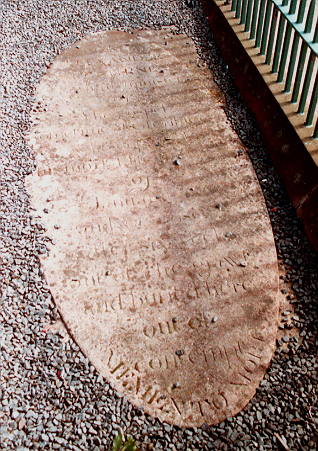 They were prevented from doing this, but they buried his body in the shadow of the scaffold – a terrible insult to the memory of a holy man, whose name will always be associated with the history of the Covenanters. This is the reason for the phrase on his gravestone inscription, “Buried here out of contempt”. His burial place was once the place of execution in Cumnock.